Shipping will be added to your total when you checkout your order. Michigan law requires sales tax on the product and shipping costs - tax will be added at the end of your purchase if you are a MI resident. 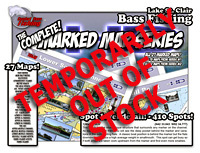 410 fishing hot spots detailed on these maps! *Now in High Definition Color!! More spots! UPDATED Spot info! More Graphics! Cut your St. Clair learning curve by 10 years!! SAVE Hundreds of $ in Gas!! 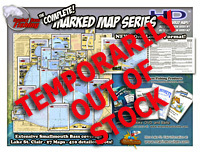 *27 bound laminated marked maps of key sections of Lake St. Clair and the St. Clair River. 410 numbered Hot Spot descriptions with synopsis pages, including many GPS waypoints to put you on bass fast! Item drop-ships from Xtreme Bass Tackle. ordering to complete your sale. A New Book for the New Lake St. Clair!! Largemouth Tactics for Smallmouth Bass... and more! *This fourth installment in the No Secrets series by Capt. Wayne reveals the massive changes in the Lake St. Clair ecosystem, and how bass anglers can manage them. High water has been the biggest game changer leaving many anglers looking for bass in new places. A shift in the forage bass has a large percentage of bass chasing down food in different ways, in different spots. Stay on top of these changes and more with Volume 4! This item is drop-shipped from the author. The latest in the Must-Have Series! 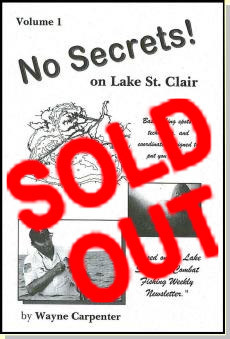 Lake St. Clair Myths... and more! *NEW from Capt. Wayne! 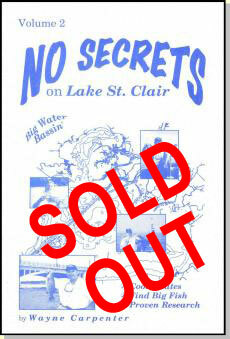 More knowledge on Lake St. Clair and the rivers is your's with this book. Hot spots and tons of GPS waypoints. The lake has changed! Get the latest! Another Hot Book from Capt. Wayne! Smallmouth bass fishing tips and tactics! Catch More and Bigger Bass! For the Serious Bass Angler! Lake St. Clair Bass and more! *Another must-have book from Capt. Wayne! 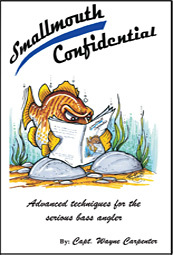 The Hottest Smallmouth Bass Fishing Tips are yours with his 3rd book. Learn advanced techniques to catch more and BIGGER smallmouth bass from the Expert! Based on 6 years of compiled study! will put you on bass right away! 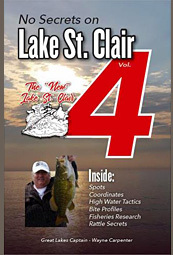 *A Must-Have book for anyone serious about being a successful bass angler on Lake St. Clair and the rivers. Full of strategy, hot spots and GPS waypoints. The Book that kicked it all off! *The original must-have book. 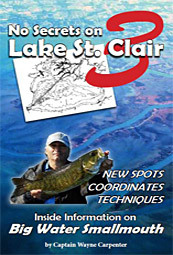 Years of knowledge and practice on Lake St. Clair and the rivers gained with this book. Detailed hot spots and tons of GPS waypoints. Try our Sponsor Advertisers or More Products from Quality Companies below.